GPRS was contacted by Greiner Electric of Littleton, CO to locate conduit for the remodeling of an apartment leasing office. 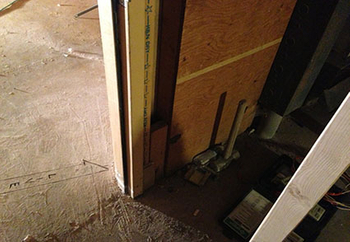 The customer was planning to remove the conduit and install new lines and needed the precise location of the current conduit. Ground Penetrating Radar Systems, LLC. was able to locate the conduit for Greiner Electric in a fast and accurate manner. 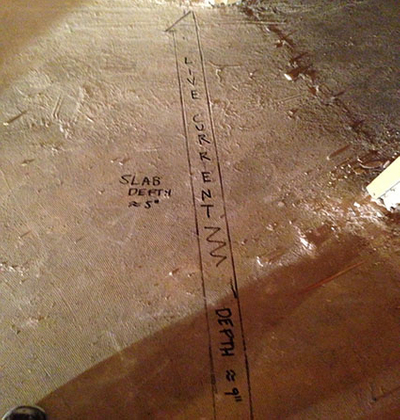 The customer needed to know how thick the slab was and how deep the conduit was buried. GPRS, LLC. was able to use concrete imaging to serve the customer with exactly what they needed for an accurate and quick excavation. Ground Penetrating Radar is ideal on projects like this because GPR does not need to scan both sides of the concrete to get an image of what’s inside and below the slab as with traditional x-ray concrete imaging. There were other workers on this construction site but GPR does not require the area to be vacant as with traditional x-ray concrete scanning. Ground Penetrating Radar emits no radiation and is completely safe to work around. All data findings can be marked directly on the surface in real time at the customer’s request for the easiest interpretation. GPR does not require any wait time for the development of films as with concrete x-ray. All of these factors save time on the job site which is ideal for the tight schedules required on most construction sites. Ground Penetrating Radar is the new way to "x-ray"! Ground Penetrating Radar Systems, LLC. can not only locate conduit under and in concrete slabs but can locate post tension cables (tendons) in concrete slabs, supply concrete imaging in pre-cast elevated slabs and twin tee’s. GPRS, LLC. also does utility locates and non-destructive testing to find underground storage tanks (UST’s), underground utilities, concrete and underground void detection. Ground Penetrating Radar Systems, LLC. has an office local in Denver and serves all of Colorado and Wyoming. Cities in Colorado and Wyoming we commonly serve are: Laramie, Cheyenne, Ft. Collins, Greeley, Boulder, Colorado Springs, Littleton, Aurora, Commerce City, Lakewood, Longmont, Golden, and Pueblo. Contact us to schedule an appointment today, or set up a lunch and learn and we’d love to come to your facility and give you more information on all of our testing capabilities. Contact Project Manager Ryan Shannon at (303) 913-8630 or ryan.shannon@gprsinc.com.